Back in March, I was tagged by C. S. Boyack to share some info on my current WIP. First—thank you, Craig!—this is a fun tag and I’m sorry it’s taken me this long to respond. Unfortunately, April blitzed by in fast-forward and I never got a chance to play. I’m going to remedy that now. Before I start, for those of you who don’t know Craig Boyack, hop over to Entertaining Stories when you get a chance. I highly recommend signing up to follow his blog as his posts are always a blast to read! A recent favorite of mine is Of Manuscripts and Mayflies. Read it and you may never look at writing and publishing the same way again. Okay, onto the goods! The rules say I’m supposed to talk about the first three chapters of my current WIP, and then share a short excerpt. Craig broke the rules and talked about his characters instead. That sets a precedent, so I’m going to break the rules and share my blurb instead (creative people never learned to color between the lines). FOOD FOR POE is a paranormal romance that takes place over Christmas. And yes, it involves a black cat…because black cats aren’t just for Halloween. As someone who was blessed by a black feline for thirteen cat-happy years, I can vouch they are mysterious and mischievous every day of the year. That’s Onyx in the pic below. He passed away a few years back, but I’ve got great memories of our time together. (Notice how he mangled his “scratchy post” which is to the right of the chair. I was fortunate he didn’t unleash all of that energy on my furniture!). FOOD FOR POE is novella length, and should finish out around 20-22K. I still have to write the closing scene, but plan on publishing the end of November, just in time for the holidays. When a blizzard strands Quinn Easterly at a handsome stranger’s house on Christmas Eve, she doesn’t realize her newly adopted cat, Poe, is the catalyst responsible for bringing them together. Breck Lansing gave up on relationships after his wife left him, unable to cope with their daughter’s illness. But the pretty blonde he rescues from a snowstorm has him rethinking his stance—especially when Quinn’s arrival coincides with a dramatic change in Sophie’s health. Should he believe an old wives’ tale about black cats, healing, and Christmas magic, or do miracles come with a price? Together, Breck and Quinn must defeat a sinister creature intent on claiming the ultimate payment. So there you have it. That’s what all of my writerly attention has been focused on lately. What do you think? Intriguing? Now that I’ve rattled on for a while, what is your current project? I know several of you are juggling new releases, so I’m going to resist “officially” tagging anyone, but please consider yourself tagged if you’d like to do a similar post. At the very least, take a moment to tell me about your WIP in the comments. As writers, I imagine each one of us always has at one story on the drawing writing board. What’s yours? This entry was posted in Blog Tag, WIPs, Writing and tagged C. S. Boyack, Craig Boyack, Entertaining Stories Blog, Food for Poe, Holiday Romance, Mae Clair, Paranormal Romance by Mae Clair. Bookmark the permalink. Great post, as usual, Mae. What should I start with? 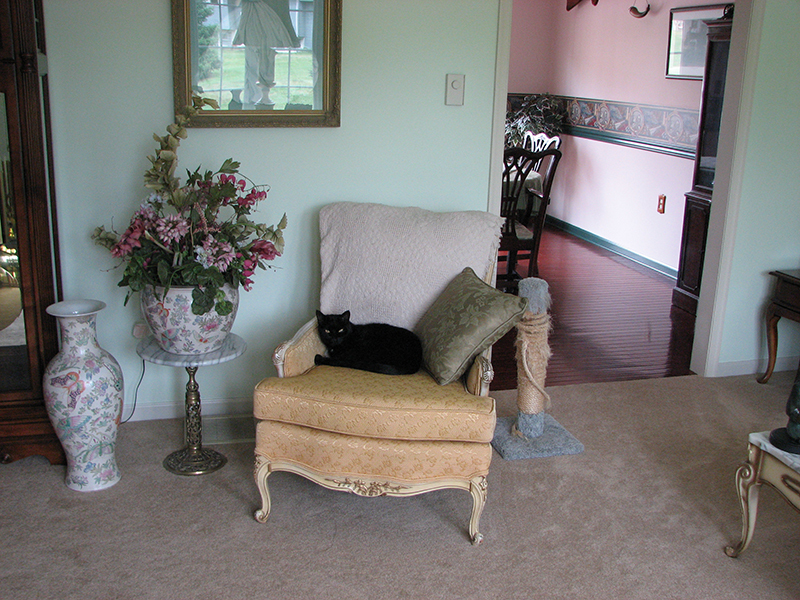 Onyx, the black cat in whose memory, I’m sure, you named the town in Eclipse Lake. What a beautiful thing to do. I too have immortalized Jack, our faithful dog in a WIP. But he’s just as he was in real life- a dog. I am a cat owner and had, along the years, many black cats. Despite the superstition around here that they are symbols of bad luck, I believe my blackies were smarter and more tender than the other cats. Unfortunately none of them is still living. Your WIP sound intriguing. Perhaps you’d make it a novel long.You know that I love stories that have a paranormal thread. Especially ghosts and past life. Thanks for the tip regarding Craig! I’ll head to his blog and read the posts you mention. Hi, Carmen. You are absolutely right that I named the town in Eclipse Lake after my beloved Onyx. It was my tip of the hat to my precious boy. How nice that you’ve used Jack in a story, too. Pets are so important to us. And many people here in the States won’t adopt black cats because of the superstition they bring bad luck, but I never realized that until AFTER I had adopted Onyx. I actually went on a search FOR a black cat. He was a charmer. So glad yours were, too. I hope you will enjoy Food for Poe when it is released. Great post. A short Christmas read sounds perfect. It’s a busy season and is a sound idea. Cool cat too. It’s almost a given that Mae has to like mayflies. And you’re right about the Christmas season… I’m constantly reading but over the holidays, short, quick reads are a plus! A mayfly swarm is a fly fisherman’s dream come true. I would have never known that. As I recall, I think we were bass fishing. Have done a lot of salt and freshwater fishing in my day, but never fly fishing. It looks like you really have to have a knack for it! Love black cats–worst part is you can’t see them in the dark, and since they own the place, they assume you won’t step on them, then get upset when you do. Your WIP sounds like a great read! Let us know when we can get eyes on it. And Craig has a fun blog; I love reading his posts. You are so right about black cats being invisible in the dark, Julie. Onyx always tripped me up…but he was all gleaming eyes when he looked in my direction, LOL. I’ve always been partial to black cats and had many as a girl, including Nefertiti and Isis. Your Onyx is gorgeous. I love the sound of your Christmas story. It’s wonderful to feature your beloved pet in such a creative and lasting way. Love the blurb, Mae. Very intriguing. Let us know when it’s finished. And I checked out Entertaining Stories blog. Thanks for the tip. As for what I’m working on… just pulling together the books in my Northstar Security series. I hope I can make an announcement on book 2 soon. Have a great weekend. Glad that you enjoyed my post and found Poe interesting. I’ve been meaning to publish this one for two years but somehow it always gets pushed to the back burner. I’m determined to finish it for this holiday season! Great post. The blurb does sound intriguing. Can’t wait to read it. Lovely post. I had a black cat once, called Jasper. I loved him. This story looks fabulous and I am looking forward to reading it. Thanks, Daisy. And I bet Jasper was a fabulous cat. I’m sure you miss him. I love black cats. Onyx is gorgeous. Christmas Eve, a blizzard, a cat and romance – I’m all in. Yay! Glad you’re looking forward to it, Emma. And thanks for the lovely comment about Onyx. He was such a delight!